Mosaic Square Mirror Tiles are the perfect accent for your mosaic projects, and they are beautiful when used on their own. These reflective mini mirrors are designed for easy nipping and application. 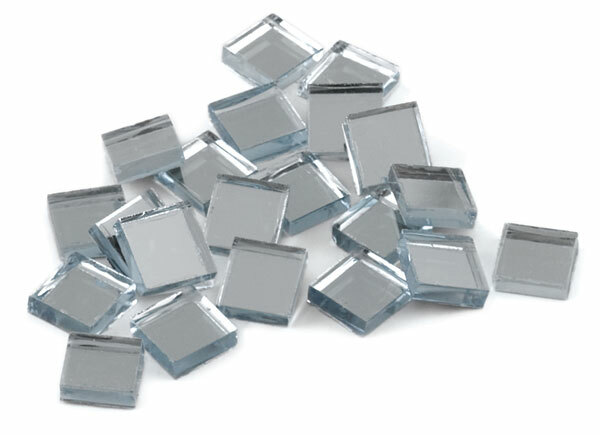 They can be used in infinite combinations with glass tile and other mosaic materials. They have a uniform 1/8" (3 mm) thickness. Tiles come in an assortment of ¾" (19 mm) and 3/8" (9.5 mm) tiles. Assorted Tiles, Pkg of 100 — These tiles come in an assortment of 3/4" (19 mm) and 3/8" (9.5 mm) tiles.